Nothing ruins your character more quickly than lying. According to psychologist George Simon, “lying is one of the many tactics by which a person avoids taking responsibility for behavior while simultaneously attempting to manipulate or manage the impression of others.” If someone lies to you even once, your confidence in that person’s sincerity and character has been lost for the foreseeable future. You no longer trust a liar or give them the benefit of the doubt. We’ve all gossiped at one point or another, and it’s not always a bad thing. Gossip can be positive when it serves to warn people about the unethical behaviors of others. However, what I’m talking about malicious gossip; engaging in idle chatter and rumors about the private lives of others with no positive motive (such as warning others). People engage in malicious gossip because of habit, compulsiveness, attention seeking, boredom, or the desire to fit in. This type of gossip serves no practical purpose other than making you feel superior to others or boosting your own ego. Gossip is perceived as something to be avoided in many cultures. There is an Irish saying “Who gossips with you, will gossip of you.” This is true because a person who gossips clearly has no compunction against spreading private information around. Spreading malicious gossip about someone’s private affairs can harm the person's reputation. If you gossip habitually, others may think that you are untrustowrthy, and it can affect their perception of your character. I have also noticed that I just feel bad when engaging in idle chatter or gossip about other people, so I have tried to stop doing it. I wouldn’t want other people talking about my personal life, so I don’t talk about theirs. I've written previously about the difference between aggressive and assertive behavior. According to The Complete Idiots Guide to Assertiveness, by Jeff Davidson, assertive behavior means “You speak up or stand up for yourself or others without diminishing someone else's rights.” By acting aggressively, “You diminish someone else's basic rights, communicating in an uncivil or disrespectful manner.” Aggressive people tend to communicate in an abusive or unkind way. Acting aggressively can cause anger or retaliation from others and possibly even physical altercations. Assertive behavior is always preferable to aggressive behavior because it allows you to assert your own needs in a way that protects the self esteem of other people. Assertive people communicate well with others while remaining clam in potentially stressful situations. They also have strong personal boundaries, and they don't allow others to treat them poorly. They communicate their own needs and desires in a tactful and proactive way. Acting assertively allows you to maintain integrity and character in your personal and professional interactions. Assertiveness can also help to prevent situations that could potentially turn aggressive or violent. Cheating is defined several ways by Merriam's dictionary. It can mean to deceive, to influence by fraud, to elude, or to violate the rules. Informally, cheating can also mean having an illicit affair while committed elsewhere. People who cheat are generally selfish, disordered, or lacking in character in some way. Cheaters want a certain result or experience without having to put in hard work. They don't want to play by the rules or keep a vow or promise. Cheating often goes hand in hand with lying and manipulation. 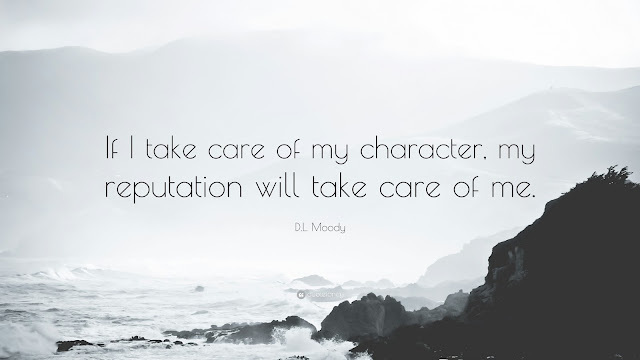 You know that you are probably doing something unethical if you feel that you have to lie to hide your behavior, to get the upper hand, or to prevent your lack of character from being exposed. Cheating can ruin your character whether you get caught or not. If you do get caught, it can ruin your life or career as well. It has been said that your character is defined by how you act when no one is watching. Having personal integrity means that you choose do the right thing, even if you know for sure that you won't get caught doing the wrong thing.